Acid reflux is a medical condition in which the contents of the stomach leak from the stomach into the esophagus. The esophagus is a tube running from the mouth to the stomach. This can lead to irritation of the esophagus, heartburn, or other symptoms. When the condition becomes chronic, it is known as gastroesophageal reflux disease. After eating, food goes from the throat to the stomach by way of the esophagus. Once in the stomach, the lower esophageal sphincter blocks food from returning back into the esophagus- a narrow tube or ring of muscle fibers. In the case of acid reflux, the seal does not work effectively and the contents of the stomach leak back into the esophagus. This can cause pain, irritation, and heartburn. The esophagus may be damaged due to the gastroesophageal reflux. There are a number of risk factors for gastroesophageal reflux, including cigarette smoking, obesity, alcohol consumption, and hiatal hernia. Hiatal hernia is a condition in which a section of the stomach moves outside the diaphragm- a muscle separating the abdominal and chest cavities. Other risk factors include scleroderma and pregnancy. Common Symptoms of Acid Reflux? 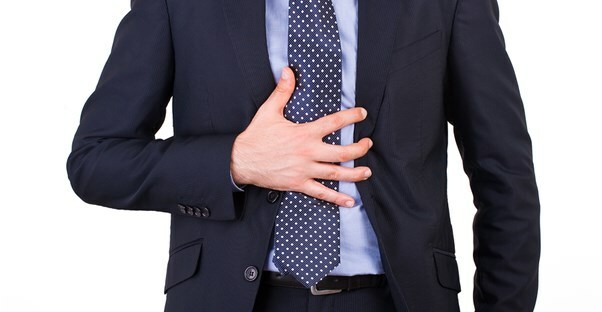 Common symptoms of acid reflux include: feeling that food is undigested or caught back behind the breastbone, heartburn which is made worse by bending over, lying down, eating, or stooping. Heartburn which gets worse at night or is provided relief by antacids can be a symptom of reflux. Another symptom is becoming nauseated following meals. Some less common acid reflux symptoms include: coughing or wheezing, hiccups, problems with swallowing, vomiting food, or sore throat. If your symptoms are severe, your doctor may recommend tests for gastroesophageal reflux. This condition is when the symptoms keep recurring even after treatment. One of the tests for this condition is known as Esophagogastroduodenoscopy or EGD. This test will check the esophagus for signs of gastroesophageal reflux damage. During the test, the doctor will insert a narrow tube with a camera on it through your mouth. The tube and camera will pass into your esophagus, small intestine, and stomach. Other tests for gastroesophageal reflux disease include a barium swallow, esophageal pH monitoring, and esophageal manometry. During the barium swallow, the patient swallows a chalky substance (barium) which coats the lining of the gastrointestinal tract. This allows it to be imaged and studied for signs of damage.